PUBLISHER: Galahad Books, by arrangement with Drake Publishers Inc.
COVER: Backgammon may well be the most exciting game ever invented, a game in which the expert player needs the betting skill of a professional poker player, the gambling instinct of a craps shooter, the mental agility of a chess master. Though backgammon is easy to learn, it becomes more and more fascinating the more it is played. It gives even beginners a rollercoaster ride full of gambling thrills and unexpected twists and turns of fortune. No two backgammon games are identical. Ties are impossible. Luck and skill alternate with breathtaking spee. With one roll of the dice, a player can tumble his opponent from the heights of a winning position to total defeat. 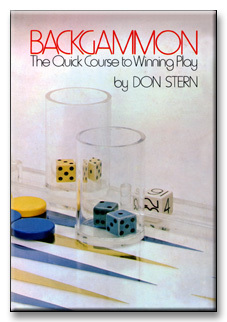 In this fascinating book, Don Stern provides a complete introduction to this game, known for 5000 years as the Game of Kings and the King of Games, and now the games sensation of the 1970s. He explains the theory, strategy and psychology of the game, offensive and defensive tactics, betting and tournaments. There are numerous quizzes to reinforce the lessons and test the reader's progress, and dozens of illustrated diagrams to make the text easy to follow. Written by a leading authority, this is perhaps the best guide to this fascinating game yet to appear. Its direct and uncomplicated approach will enable even a beginner to move quickly through the basics of play and onto the intriguing complexities of higher-level bettingand winning! AUTHOR: A certified director of the American Contract Bridge League, Don Stern is a games lover who has edited and collaborated on a number of games books. His devotion to backgammon is enthusiastic. He not only plays the game, but teaches it and directs tournaments as well. A marketing executive at a New York publishing company, he lives in Larchmont with his wife and four children.